Millions around the world use Snapchat on a daily basis to share their lives and to stay in touch with friends and family, not because it's so easy from the moment you download/install the app, but because it's a lot of fun to use! To get you to try and enjoy the good stuff, we thought we could help you out with a quick Snapchat guide. So, fasten your seatbelt - it's gonna be a fun ride - with a lot of information to digest! Here, you can see a bunch of stuff from avatar/ghost (or story if you've posted one during the last 24 hours), search, night mode, camera flash at the top to the Snaps, Snap shutter button, memories, and Stories at the bottom. After getting to know the home screen, let's get to that beautiful elephant in the post: the filters that make the elephant beautiful! Filters, or Lenses as Snapchat officially calls them, are one the best features of Snapchat - and of its competitive advantages as it shows how strong their AR game is. To activate the lenses, tap on the screen [somewhere there's no icon] and you can see the lenses appear in a line at the bottom - where the shutter is. Don't forget to try the 'dog face' lens and the 'make me gorgeous' lens! 👻 Remember, the lenses change from time to time. Some might be active for a day, some for a few days, and some are usually there, like the 'dog face' lens. So, make the most of the ones that are available. 👻 Also remember, some lenses are location-based, meaning they're only available at specific locations. After mastering the lenses, it's time to move to your profile. Tap the ghost or your avatar - or an image representing your latest story - at the top left corner to access your profile. Here, you can find your Bitmoji, Trophies (come back soon - there's gonna be more posts with more answers! ), Snapcode, Add Friends, and your Stories - and of course, the app Settings! 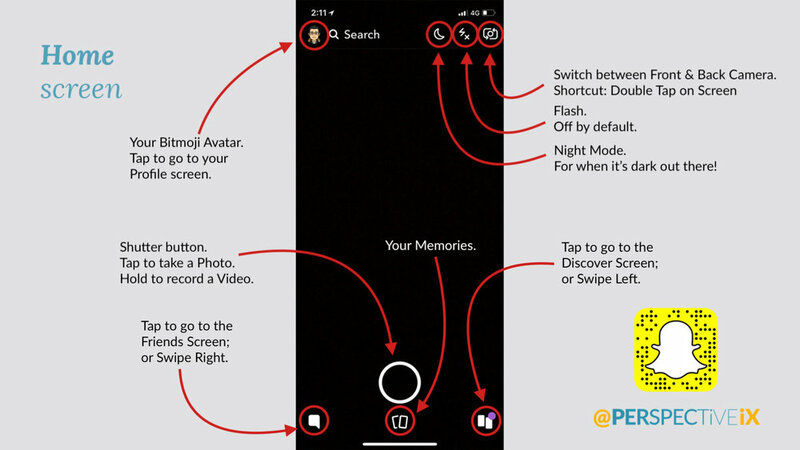 Now if you go back to the home screen and swipe from left to right - or tap on little message bubble on the left-hand side of the shutter button - you'll arrive at your Friends Screen, where you can see your private messages and your friends' stories. If you've just joined, it might be a bit lonely here. But don't worry, Snapchat staff story won't let you feel lonely and it is actually worth watching. It gives you some clues about the app and what's going on, plus the new features and updates and stuff. Is that too much to remember? Just remember that red is for photos (no audio), purple is for when there's audio, and blue is for chats! But wait... What's the point of all this? Well, have you ever opened a new message in a meeting or somewhere quiet, and it's been a video with your phone on max volume? This will help make sure that won't happen again! When you swipe left from the home screen or tap on the icon at the bottom right corner, you land on Discover screen. Friends' stories and public content from different publishers used to be here. Now that your friends' stories have moved to the Friends screen, you'll see only public stories and content here on discover page. Tap on a story to watch it. Press and hold to subscribe to or unsubscribe from a publisher. Now that you know your way around Snapchat, it's time to create and share some Snaps! On Snapchat, you can send private messages/stories and messages/stories to groups of friends. You can also share snaps to your story (called "my story" on the menu) and it will be visible to everyone who follows you (has added you) - aka your friends! You can also share snaps to public stories (called "Our Story" on the menu). This one is an interesting way to get some exposure (but we'll get back to that). 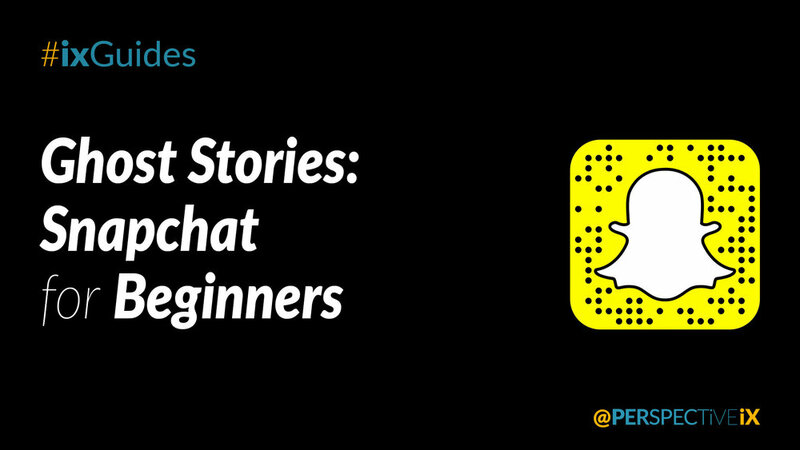 👻 Remember, Snapchat limits the videos to 10-second slots, and you've got 6 consecutive slots. So, after every minute of recording videos, you should either share the Snap, save it, or close/cancel it. After sharing a story, on Profile screen, you can see how many times your story has been seen. Depending on your privacy settings, your story can be visible to no one, your friends (people who follow you), or the public. As mentioned earlier, if you want to use Snapchat lenses, you should use them on your face (or others' faces) while taking photos or recording video. But the fun doesn't stop there. You can add text, stickers, and overlays to your Snaps after taking them by swiping left or right. Would you like to know more? Let us know in the comments and I'll create the next Snapchat guide for iX Insiders! Oh, and check us out on YouTube and Instagram! There's a lot to learn!